Voilà mon « Ceci n’est pas un napperon » fini et épinglé. J’ai finalement faire 2 rangées d’anneaux fendus pour le finaliser. Je maintiens le suspense sur l’usage final de cette pièce, et donc je vous fais encore patienter pour le partage du patron. Love the interwoven long chains !!! 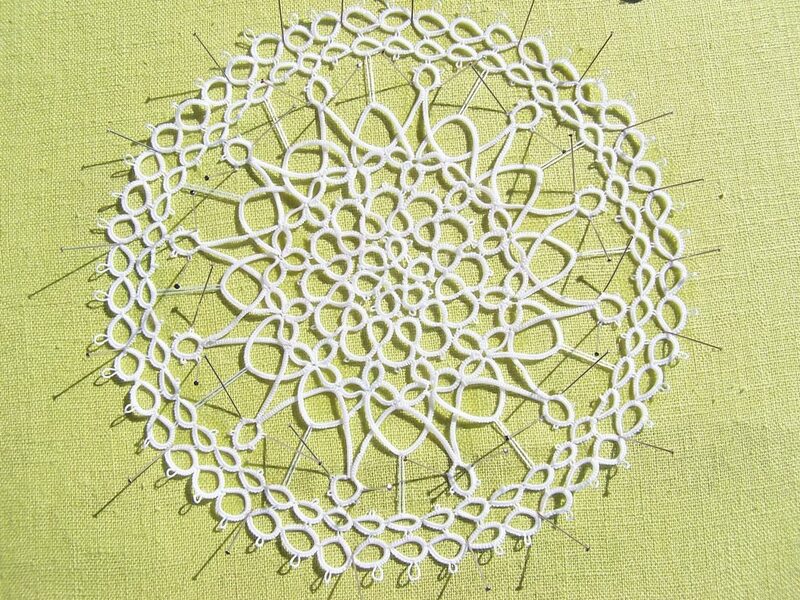 And your tatting is so precise and perfect ! So, if I may ask … For the interwoven rounds, did you use 4 shuttles, Celtic shuttles, or simply passed the 2 shuttles (for next round) through the spaces in the previous round ? It’s much simpler than that. Its whole pattern works with a single shuttle. I tat the first part of the interwoven round, and then the second part with a little shuttle (Prym brand). But in fact, it would be possible to make the 2 together.